Rookie Jusuf Owega produced a sparkling performance on his debut for the Hathersage-based Hillspeed team in the BRDC British Formula 3 Championship at Rockingham. Teenager Owega, who hails from Cologne in Germany, secured an excellent top-eight best at the Northamptonshire track in his first competitive outing in single-seater cars. 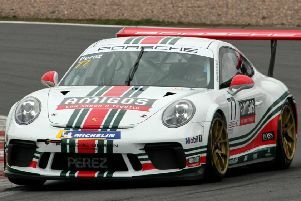 Teammate Sasakorn ‘Cutter’ Chaimongkol also posted a top-eight result in a race affected by the need for a safety car, while Hillspeed’s Canadian driver, Ben Hurst, made his first appearance in the top ten in the same contest. Team principal Richard Ollerenshaw said: “We’ve all been very impressed with Jusuf. He’s done an exceptional job. “There’s clearly a lot of potential to build on. The aim now is to continue making big strides forward against much more experienced opposition. All three Hillspeed drivers defied lack of previous experience at Rockingham. They now have a four-week break from action until the championship continues at Snetterton, Norfolk over the weekend of May 26 and 27.